Hi friends! I'm Jodi from The Clutter-Free Classroom and one of my absolute favorite things to do is transform piles of furniture in a bare space into a colorful, organized home away from home for teachers and students. Although some educators have already made their way back into the classroom and kicked off the new school year, many are still enjoying the last few weeks of summer vacation and dreaming about what their learning space will look like this year. The good news is it is easy to create a customized, beautiful room on a budget. I am excited to share some tips from my FREE Classroom Decor Guide. 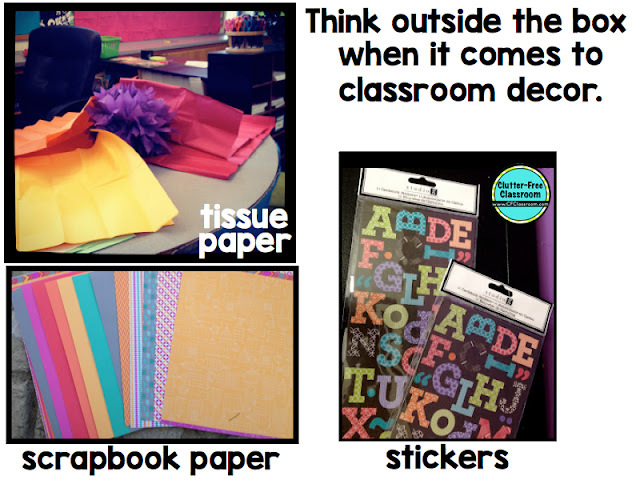 It is helpful to start by picking a color scheme for your classroom. Picking a main color with 1 or 2 accent colors looks great. Once you have your color scheme selected the real fun begins. Using materials that are not found in the pages of a teaching store catalog will allow you to make the most of your color scheme, save money and create a look with patterns and textures that make it one of a kind. 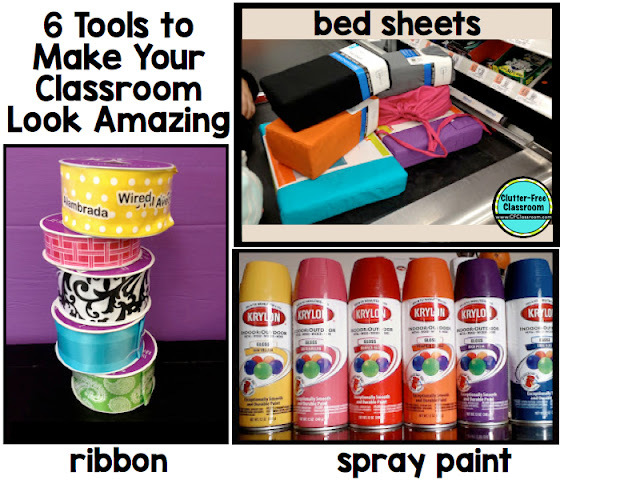 Here are some of my favorite things to use when decorating a classroom. Ribbon comes in every color and pattern you can imagine. It’s handy because it is available in a variety of widths. Use it as trim on bulletin boards, around windows, charts, posters, and more. Ribbon can also be hot glued to painted or paper-covered cans to use as inexpensive supply holders or tied to clipboards and containers to give them pizzazz. Tissue paper can be used to create pompoms to hang from the ceiling or staple to the wall. These will be fun accents for your space and are very easy to make yourself in no time. Fabric can be used in place of paper to back bulletin boards. It can also be used to create extra storage space and hide visual clutter by covering open shelves. Unlike most papers it won’t fade. Staple holes are not noticeable which makes it a wonderful investment that can be used year after year. Instead of purchasing pricey fabric by the yard, I suggest getting solid color bed sheets. They come in lots of colors and sizes for very little money. As an added bonus you can get matching pillowcases to use with standard pillows for a cozy and coordinated look in your classroom library. Scrapbook paper is perfect for backing shelves and providing pops of color. Individual pages can be used to designate spaces for displaying student work. Spray paint will allow you to make the classroom look cohesive. Use it to update furniture, containers, storage drawers, and more. Just be sure to purchase paint specifically for plastic if necessary. Letter stickers can be used for adding titles to displays, labeling items, creating a welcome sign on your door and so much more. Number stickers are also available and work well on cubbies, mailboxes, etc. 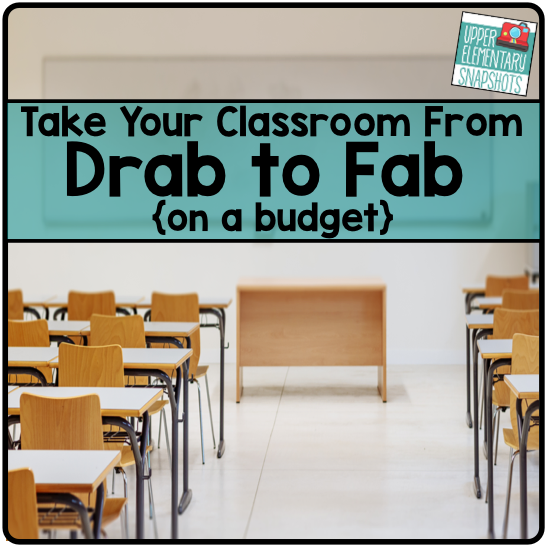 I welcome you to download the Guide for Classroom Decor on a Budget for FREE here. 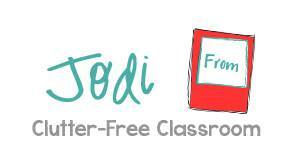 I would love for you to stop by my personal blog, The Clutter-Free Classroom to find lots of tips and photos to help organize and manage your classroom.